Q: How is the coalition faring? A: Things are much better now than before. This is because the 23 SLFPers in the Government are not criticising personalities in the Government, such as what we saw earlier when the Prime Minister and others were regularly attacked. There are two sides to it: not only our side, but the UNP members too engaged in the same. But this has stopped due to the self-realisation that it was endangering the very coalition. Instead, there are many fora where differences can be discussed and resolved. 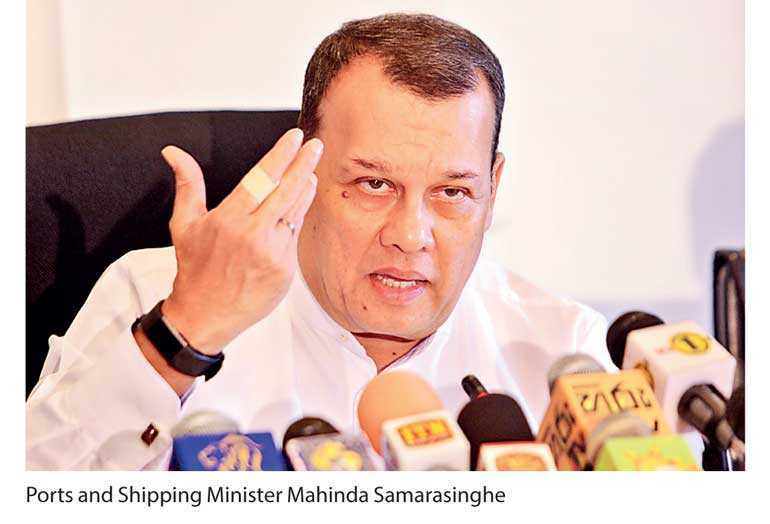 The latest is a group of four senior SLFPers (Mahinda Amaraweera, Dr. Sarath Amunugama, Duminda Dissanayake and Mahinda Samarasinghe) and UNPers (Malik Samarawickrama, Kabir Hashim, Akila Viraj Kariyawasam and Mangala Samaraweera), appointed by the respective party leaders. This group meets weekly and discusses various issues and follows up with another meeting with the two party leaders on a fortnightly basis. This group consults other party members on a need basis. So overall, the relations are much better. There is a realisation that whilst we fight for our own ideologies or party-specific agendas, we also need to compromise without seriously harming the policies or principles we represent, via discussion. Mahinda Rajapaksa has claimed in an interview that President Sirisena had spoken to him (Rajapaksa) when the no-confidence motion was going to be taken up in Parliament, and asked for his support, and that halfway through the process President Sirisena lost interest and pulled out. My reading of what Rajapaksa says is that on the one hand he (Rajapaksa) is trying to create a clash between President Sirisena and Prime Minister Ranil Wickremesinghe. We all know that Rajapaksa is a master at that game. On the other hand, what has the President got to do with the no-confidence motion, because the whole country knows it was drafted by the Joint Opposition and handed over by Rajapaksa himself to the Speaker? So why should President Sirisena speak to Rajapaksa and ask his support on a resolution handed over by him? It is such a contradiction and confirms that Rajapaksa’s statement is not correct and is politically motivated. This shows that Rajapaksa’s objective is not to tango with President Sirisena, but to create tension between President Sirisena and Prime Minister Ranil Wickremesinghe whenever he can and continue to be the kingmaker. That shows the President doesn’t have any truck with the Rajapaksas. Q: Has the experiment of a Coalition Government survived the test? A: Not really; we are still sorting out teething problems. The effect of the delay in resolution and the failure to work together were seen at the last Local Government elections. With presidential elections ahead, there is a realisation that ‘enough is enough’ and that the coalition must deliver. We must move fast on high-profile corruption cases, with the setting up of three new High Courts in July. The Government is also stepping up accelerated development at the grassroots level via the Gamperaliya program and the 2025 Enterprise Sri Lanka initiative, which will not only boost exports but also local industries and farmers. These two projects are examples of the two ideologies meeting together, identifying common grounds, and compromising to accommodate ideas in the best interest of the country. Q: There is a lot of political talk over presidential candidates. What is your take? A: Judging by recent interviews in the press by former President Mahinda Rajapaksa, there appears to be a lot of confusion in the Rajapaksa camp as to who will be the eventual presidential candidate, if they are going to put one forward. For example, in one interview, when asked about whether Gotabaya Rajapaksa is going to be the presidential candidate, Mahinda avoids a direct answer and says Gotabaya is supported by only one section of the population, whilst there are others who are also supported by other sections of the population, and that no decision has been taken as yet. So, although Gotabaya Rajapaksa is going pell-mell portraying himself as the presidential candidate, Mahinda Rajapaksa himself is saying it will be he who chooses who is the candidate will be. It seems Mahinda Rajapaksa hasn’t made up his mind whom to support. It will be interesting to see who ‘the other people’ are that Mahinda says are supported by the people. The biggest shortcoming, it seems, is that there is no one being talked about aside from members of the Rajapaksa family. Is it only the Rajapaksas who are fit to be presidential candidates? Is there internal democracy in Pohottuwa? As far as the SLFP is concerned, we want President Maithripala Sirisena to be the next presidential candidate, as we believe he is the best suited. There is no family bandyism on the part of President Sirisena in grooming his son, or anyone from his family, to take over from him. It is an open field in the SLFP. This is the difference. To be the president of Sri Lanka, you not only need hard-core supporters, but the support of the floating voter base, the minorities, etc. Just getting the votes of the ideologically-based group is not enough. You must be able to appeal to all the people of Sri Lanka. I can’t see the Rajapaksas being able to do that again, because of the things that happened in the past. If Mahinda Rajapaksa couldn’t get re-elected, how could anyone else in the Rajapaksa family? Q: 16 of the SLFPers decided to sit on the Opposition. Isn’t that a setback for SLFP? A: The Group of 16 have not defected to the Joint Opposition but are sitting independently in the Opposition whilst being SLFPers at present. The JO is demanding that the 16 must leave the SLFP and join them. If you take the proximate 15% of the vote that the SLFP won at the Local Government elections, my analysis is that it is not the hard-core SLFP voters, but consists of people who like the President, his policies, and believe that he is the right person to lead the country. It is also the support base of those 23 MPs who are firmly with the President. This overall support base is unlikely to be eroded. The on-going re-organisation of the SLFP can only enhance the support base, rather than dilute it. In a presidential election, this 15% of votes will be very decisive. This is the same when it comes to a parliamentary election. So, we are a very strong force. I feel the SLFP support base can only be better. Therefore, we believe that President Sirisena should re-contest and be re-elected. Q: What are the chances of a common candidate at the next presidential polls? A: Let’s see. We are hopeful that President Sirisena will get the backing of other parties. One-and-a-half years is a long time in politics, and lots of things can happen, and it may not be prudent to speculate at this juncture. However, we strongly believe that President Sirisena must be given another term of office, which will only be good for the country. Q: Are you certain that President Sirisena still has the confidence and the conviction? A: When he took over the SLFP leadership three years ago, he started from zero. A good example is the first May Day rally after the 8 January 2015 presidential election, at Hyde Park. We were competing with Kirulapone, which had thrice the crowd, and the irony was that people sitting on the Hyde Park stage were also seen at Kirulapone later giving speeches. From that time to the 2018 May Day rally in Batticaloa, there has been a huge difference. When we reach the grassroots as part of the SLFP re-organisation, we are seeing that people are coming back to the SLFP proper again despite some of them having voted to Pohottuwa at the last LG election because of an anti-Government feeling, because they have realised that due to the in-fighting in Pohottuwa, they don’t see a future. What is the future of Pohottuwa when Mahinda Rajapaksa eventually retires from politics? Who will take over the party? This is what happens to a lot of new, smaller parties. The same happened to DUNF, and even when the likes of Lalith Athulathmudali and Gamini Dissanayake were active, they couldn’t draw the desired numbers from the UNP. People are beginning to realise. I strongly feel that if we do our work at the grassroots level diligently and efficiently, the SLFP can win back a lot of people who shifted to Pohottuwa. SLFP will continue and not fold up, but the future of Pohottuwa is a big question: after Mahinda Rajapaksa, then what?